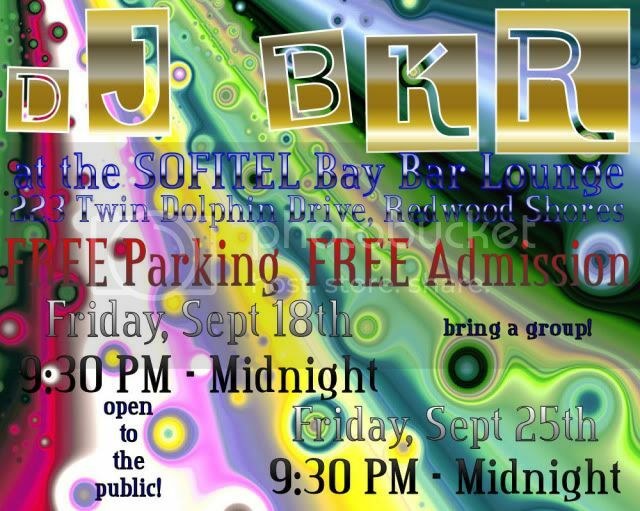 .. For all your entertainment needs ..
SOFITEL Bay Bar Lounge public appearance by DJ BKR! Join me, DJ BKR, in the main lounge at the SOFITEL San Francisco Bay Corporate Resort. I will be playing 70’s, 80’s, 90’s & other dance music from 9:30 PM until Midnight. I would love to see all of you! This event is open to anyone who wishes to come and hang out and maybe do a little bit of dancing! This is a perfect opportunity to take advantage of this great lounge area that you would otherwise have to pay for if you had a group! Come with your friends and grab one of the many sections of the lounge and hang out all night! 2 FRIDAY NIGHTS THIS MONTH! September 18th & 15th!! Cris was absolutely the perfect DJ for our wedding. We met him at a local trivia and after getting to know him decided he'd be a fun fit for providing us all the fun tunes to the wedding! He did not disappoint. He's been in the industry for an awesome amount of time which gives him a ton of experience and familiarity with helping support the wedding. He's extremely prepared and communicable, sending us song templates to get us started in building out the music for the entire night. He also helped guide us when we were stuck on decisions and shared song lists to keep us on track. He's timely in both any pre-wedding meetings and to the actual ceremony to make sure he's able to set up and sound check his equipment. He's a really fun DJ - totally organized and very comfortable doing intros & any other funny commentary throughout the night. Highly recommended! !